One of many New Zealand attractions can be found at a famous vacation spot, the Bay of Islands, located off the North Island of New Zealand. A New Zealand attraction in the Bay of Islands is the view over Motuarohia (Roberton) Island from the 350m long track in the Bay of Islands, Northland, East Coast, North Island, New Zealand. Please make sure to visit our page about New Zealand Attractions from the North Island and the South Island of New Zealand. 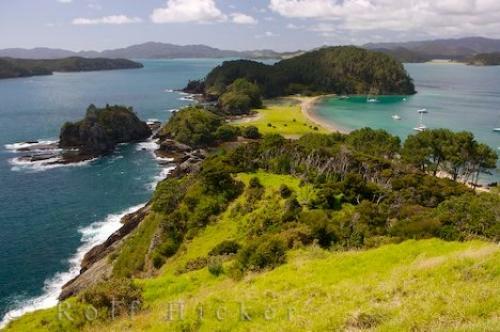 One of many amazing views in the Bay of Island, Northland, North Island, New Zealand.